The new CLEAN TWIST System from Leifheit is the perfect system for the cleaning of sensitive floors like parquet and laminate. No water damages or dirt scratches: thanks to the unique Leifheit rotation mechanism the wiper cover becomes as dry as with no other system. The dirt is simply spun out - and this, without bending down, without hands in the dirty water and without laborious foot operation. This enables the extendable handle and the built-in stop mechanism. The new revolutionary tumbling mechanism from Leifheit is hidden in the inside of the floor wiper handle: pressure of the handle starts the rotation of the floor wiper. Repeated pressing influences the individual level of wetness of the wiper cover. The new floor wiper with its wiping width of 42cm is extremely flat bendable and reaches therefore hard to reach areas like those under cupboards and beds. Thanks to its practical all-round cover it cleans corners and edges at the same time. 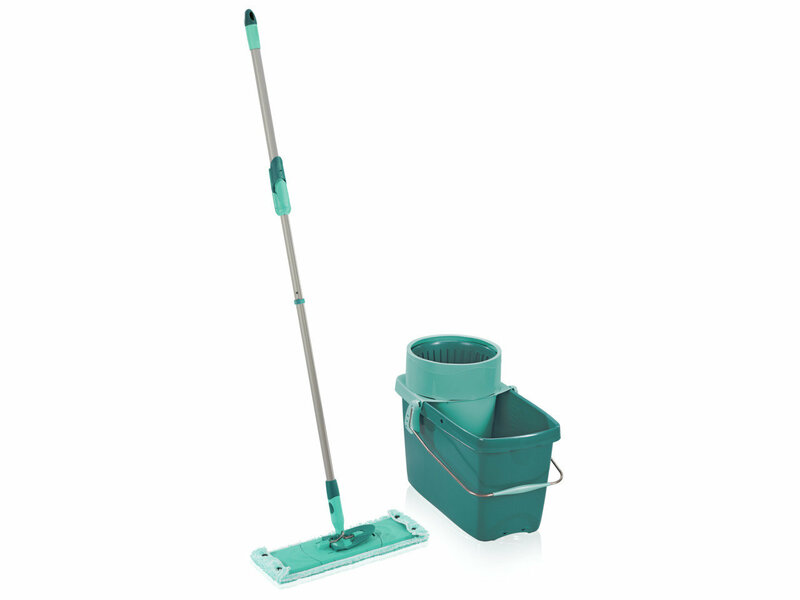 The Leifheit CLEAN TWIST System includes the floor wiper extra soft with tumbling mechanism, a universal usable bucket with a volume of 20 litres and the tumbler.